I am working on a MS related reference book and while exploring the most common reasons why engineers pursue graduate studies, the answer came out to be this. The most lucrative thing about studying in USA is the ability to work afterwards without much difficulty. If you study from a Top 50 school, you have a pretty good chance of landing a job. But many aspirants wonder how much? And if it justifies the higher cost of study. What’s more? I talked to some professionals who recruit engineers for their companies and when I asked hows the recruitment scenario, I got a unanimous reply – a resounding ‘it is a good time for engineers as lot of career opportunities are floating around and we have more positions than qualified candidates’. So, if you are on fence about whether to join a graduate school in US or not, this is your answer. 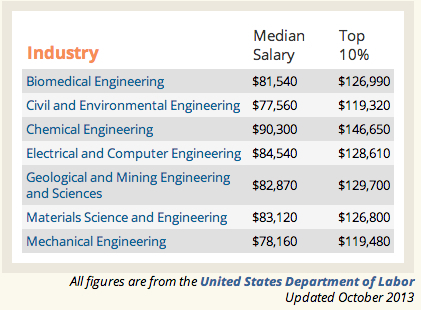 The market is back in shape (at least for engineers) and it was never more lucrative to earn in dollars. Looking for expert COUNSELING help in last minute? Check out our cost effective packages and subscribe to our newsletter! Thanks for the information. This article clarified doubt’s on salaries after MS. It will be difficult to pay back the loans and save money at the same time. And I read somewhere that to buy an iphone after graduation in Usa, say $500, it takes about 2-3 days. But in India it takes an entire months salary or even that won’t be enough.